Yes, it's true; apples do grow in hot climates and the tropics, where there are very few or zero chilling hours and hot days with warm nights. And they have been growing there for years, producing colorful, crisp, juicy, spicy apples. We have sought out these apple varieties from all over the world and offer them along with the educational materials needed to grow them. Our trees are growing from the blast-furnace heat of inland Southern California to the tropics of Equatorial Africa. We've shipped to Mumbai, India, Bangkok, Thailand, Belize, the Caribbean, Phoenix, Arizona, the Middle East, and the American Deep South. 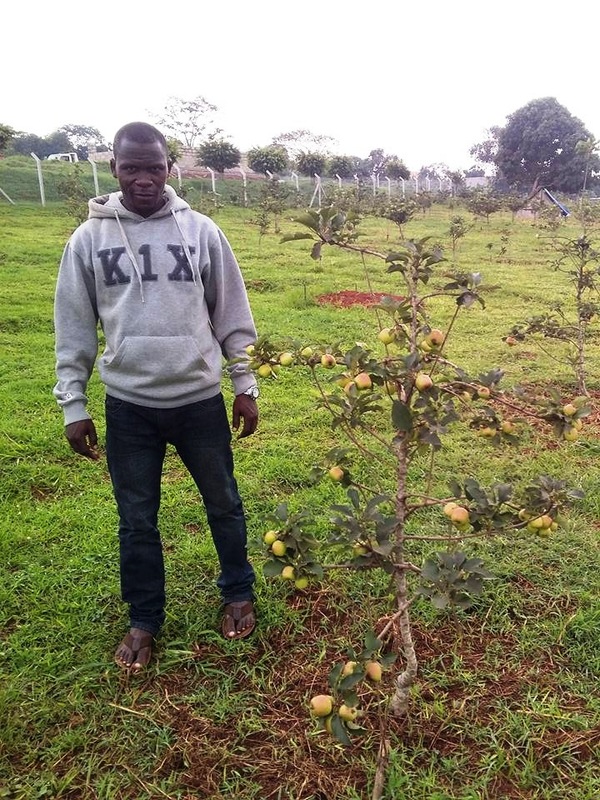 Our trees are growing in the gardens of presidents and kings, as well as the gardens of tiny remote African villages. This year we even opened a branch in Uganda to better serve the African Continent. With such experience we are certainly able to service your hot climate location. 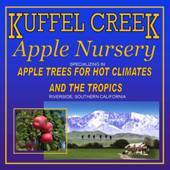 "Kevin Hauser of Kuffel Creek Apple Nursery...is "the man" to explore the possibilities of low chill with respect to apple varieties..."
We sell exclusively benchgrafts, infant trees consisting of a rootstock (the roots of the tree) with a scion (cutting) of the desired variety grafted onto it. 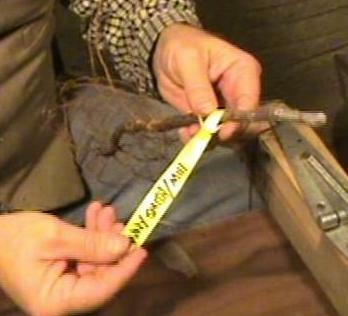 The benchgraft is bare-root and dormant and can be economically shipped long distances and grows vigorously when planted, often reaching six feet (2 meters) the first season. Our shipping season runs February through April, with no availability the rest of the year. caliper, with a single bud grafted on the end. The rootstock we graft onto is M111 EMLA, a virus-certified clonal rootstock that is very adaptable to heavy clay or light sandy soils, worn-out soils, and drought conditions. It is well-anchored and resistant to wooly aphid, an underground pest. It naturally makes a fairly large tree but can be pruned to remain any size. We've tested over 100 apple varieties in the 113ºF (45ºC) heat of Southern California where the lack of chill also tests the apple's productivity. Top varieties from these trials are forwarded on to equatorial Africa for further testing in the tropics. We've picked a list of our favorites that are well-adapted to hot climates and the tropics and also keep notes on the losers for reference. On another note, almost all of our varieties do well in colder climates, and we ship to northern locations all the time. 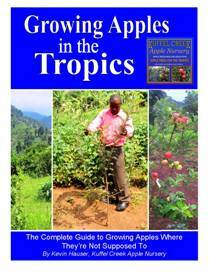 Our two books, Growing Apples in the City and Growing Apples in the Tropics give the warm-climate and tropic apple grower the information needed to raise apples where they're not supposed to grow. 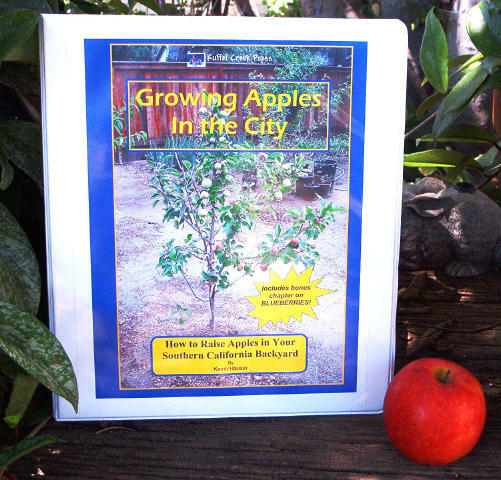 Author Kevin Hauser also speaks to gardening groups in Southern California and Arizona.